Ladies can wear these trendy Casual IndoWestern dresses on any occasion from Ishika Fashion festive celebrations. 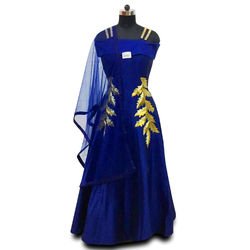 There are a variety of Indo western dresses for women. We are the leading Exporter, Manufacturer and Wholesaler of Lehenga choli. Net lehenga with Embrodiary work on party wear lehenga cholis.